This is another one of those robots that I have absolutely no information on! 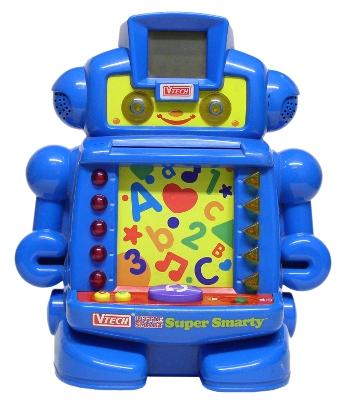 It is apparently the big brother of Talking Little Smart Smarty. Just like TLSS, there are selector buttons on both sides, an "action" button (this one located on the 'Control Panel' in front), and it would appear that this robot uses cards and booklets, too. In addition to all of that, there is also an LCD screen in top of his head to display the various results and prompts.